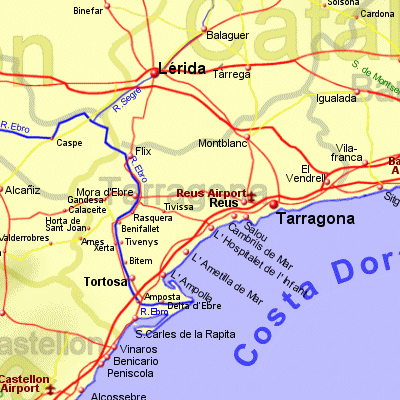 Tarragona, the most southerly province in the Catalunya Region, is uniquely varied with the golden beaches of the Costa Dorada, the Roman history in the city of Tarragona, and the important river ebro running near the southern boundary. The river Ebro, the longest river in Spain, has paid an important part in shaping this part of Spain and its history. Where the river empties into the sea, a large flat delta area has formed in the Mediterranean, where 15,000 Ha of rice are grown in traditional paddy fields each year. Parts of the delta are also home to an important selection of waterfowl. One way of viewing this area is on one of the many boat trips available on the ebro as it runs through the delta. The sheltered Mediterranean waters in the large naturally sheltered areas around the delta are used for the production of a variety of shellfish, including muscles and oysters, which are available in local restaurants. In-fact, you really should not miss the opportunity to enjoy a paella made from local ingredients, including the rice, which has special qualities for absorbing flavours. Further upstream on the river ebro you will find important villages and towns which have been strongly influenced by the river itself, including Miravet, with it's small vehicle carrying ferry powered only by the river's current, and it's historic castle, looking over the village from it's vantage point. It is worth the walk to the castle (or you can drive) for the stunning views down river from here, or again, you can view the area from a boat trip, available from the town of Mora d'Ebre. A little further still upstream is the Terra Alta wine growing area, and a number of the villages or towns in the area have large bodegas with some impressive architecture, notably, that at Gandesa, the capital of the Terra Alta D.O. Just south of the river Ebro, near the small city of Tortosa, lies the Els Ports Natural Park, a limestone massif rising to over 1,400m (there is a road to the very top, from which you will find stunning views on a clear day). The capital city of Tarragona also has much to offer, having been important in Roman times, with a number of ruins from that era with a visit, including the Roman Amphitheatre. Just 15Km away, the smaller city of Reus, the birth place of Gaudi, has a lot to offer, with scores of modernist buildings to admire, though none by Gaudi himself. The Gaudí visitor centre in Reus is also well worth a look.